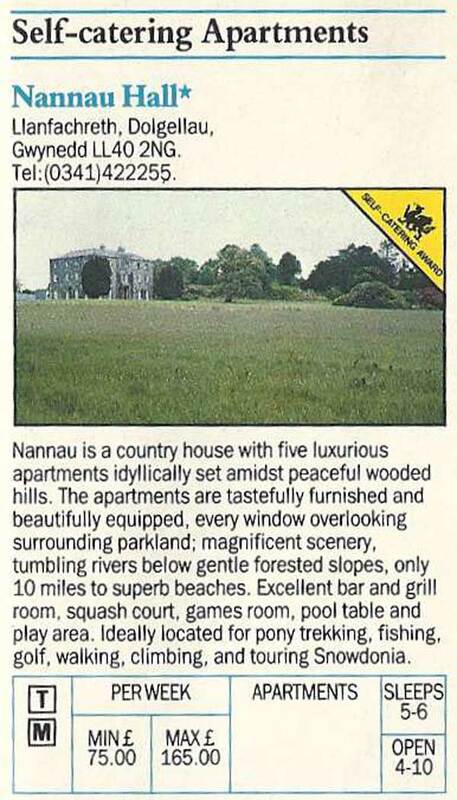 Nannau is a country house with five luxurious apartments idyllically set amidst peaceful wooded hills. The apartments are tastefully furnished and beautifully equipped, every window overlooking surrounding parkland; magnificent scenery, tumbling rivers below gentle forested slopes, only 10 miles to superb beaches. Excellent bar and grill room, squash court, games room, pool table and play area. Ideally located for pony trekking, fishing, golf, walking, climbing, and touring Snowdonia.